Stabilization and dispersion of electrical charge by colloids in non-polar media, such as nano-particles or inverse micelles, is significant for a variety of chemical and technological applications, ranging from drug delivery to e-ink. 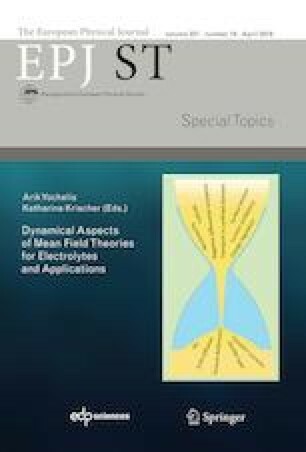 Many applications require knowledge about concentrations near the solid–liquid interface and the bulk, particularly in media where colloids exhibit spontaneous charging and change in chemical properties. By modification of the mean field equations to include the finite size effects that are typical in concentrated electrolytes along with disproportionation kinetics, and by considering high potentials, it is possible to evaluate the width of the condensed double layers near planar electrodes and the bulk concentrations of colloids. These quantities also provide an estimate of the minimum initial colloid concentration that is required to support electroneutrality in the dispersion bulk, and thus provide insights into the duration of quasi-steady state currents that have been observed in inverse micellar media.